Today a tweet from prophetess Andrea circulated on social media after she claimed Beyonce's performance at the just concluded BET awards was demonic and symbolized the 'lake of fire,' . 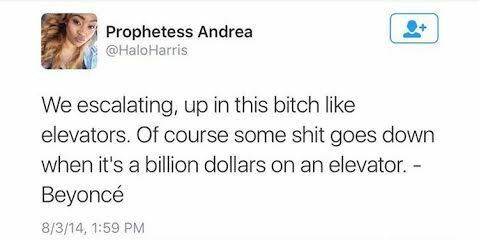 Twitter trolls and possibly Beyonce's fans have now dug up a 2014 post of the prophetess where she was tweeting some Beyonce's lyrics. Lol , maybe she wasn't in the lord then.